Hello my beautiful scrappy friends ..
with a black and white photo of my Daughter and grandson . I love when I have a special photo to scrap . under and around the photo . REMEMBER you can purchase Dusty Attic chipboard directly from the website . thanks so much for popping by and hope you are inspired to play. 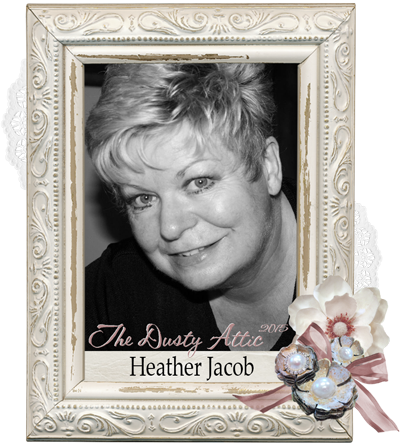 Your page is stunning Heather. Awesome layering and I love the way you layered some of the chippies. What a gorgeous page Heather! Your daughter and grandson are beautiful as well! Love the chipboard! You really know how to make your photos shine. This lay-out is absolutely gorgeous and a great way to showcase that photo. Beautiful! LOOOVE those white splats around the edges & the rope on the heart looks STUNNING!!!! Absolutely GORGEOUS! You are the master of layers!!!! oh oh oh! this is so beautiful.. you are queen of monchrome... this is so pretty.. lovely photo surrounded by the layers and layers of love placed embellishments.. love this one.. I hope your week has been a good one! The layering you create is always so inspirational! Beautiful LO! You had me at monochromatic....Seriously though- you had me at I posted a new layout. :) Love it of course! Thanks for sharing! I admire how you can create lovely layered and dimensional pieces of art without adding large poofy flowers. Wonderful, Heather. I always love your monochromatic pages and this one is great again. Lovely photo! Lovely page.....your layering is Awesome Heather.